The 62nd BFI London Film Festival has announced that 'The Favourite', a film directed by Academy Award nominee Yorgos Lanthimos and starring Olivia Colman, Emma Stone and Rachel Weisz, as this year's American Express Gala. The film will receive its UK premiere on Thursday 18 October at the Cineworld, Leicester Square. It's the early 18th century and England is at war with the French. Nevertheless, duck racing and pineapple eating are thriving at court. A frail Queen Anne (Olivia Colman) occupies the throne and her close friend Lady Sarah (Rachel Weisz) governs the country in her stead while tending to Anne's ill health and mercurial temper. When a new servant Abigail (Emma Stone) arrives, her charm endears her to both Sarah and the queen, and Abigail sees a chance at a return to her aristocratic roots. As the politics of war become intense, so too does intrigue at the palace. Abigail is determined to fulfil her ambitions and she will not let woman, man, politics or rabbit stand in her way. 'The Favourite', a film by Academy Award nominated Yorgos Lanthimos, is written by Deborah Davis and Tony McNamara and produced by BAFTA nominee Ceci Dempsey, Academy Award nominee Ed Guiney, BAFTA nominee Lee Magiday and Yorgos Lanthimos. Starring BAFTA and Golden Globe winner Olivia Colman, Academy Award winner Emma Stone and Academy Award winner Rachel Weisz. The Favourite also stars BAFTA nominee Nicholas Hoult, Joe Alwyn, James Smith, Primetime Emmy winner Mark Gatiss and Jenny Rainsford. "This is wickedly funny filmmaking from Yorgos Lanthimos who is operating at virtuoso frequency. The Favourite is a delight from start to finish, powered by a trio of riotous performances from Olivia Colman, Emma Stone and Rachel Weisz who are all clearly revelling in the wit and rhythm of the script. The perfect Gala for our principal partner American Express." 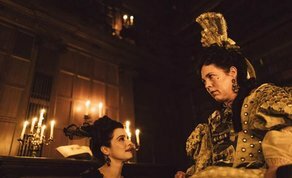 From Fox Searchlight Pictures, Film4 and Waypoint Entertainment, an Element Pictures/Scarlet Films Production, The Favourite is released in cinemas across the UK and Ireland on 1 January 2019.